Clearance work has begun this week on the site where a new supermarket is to be constructed in Tullamore. 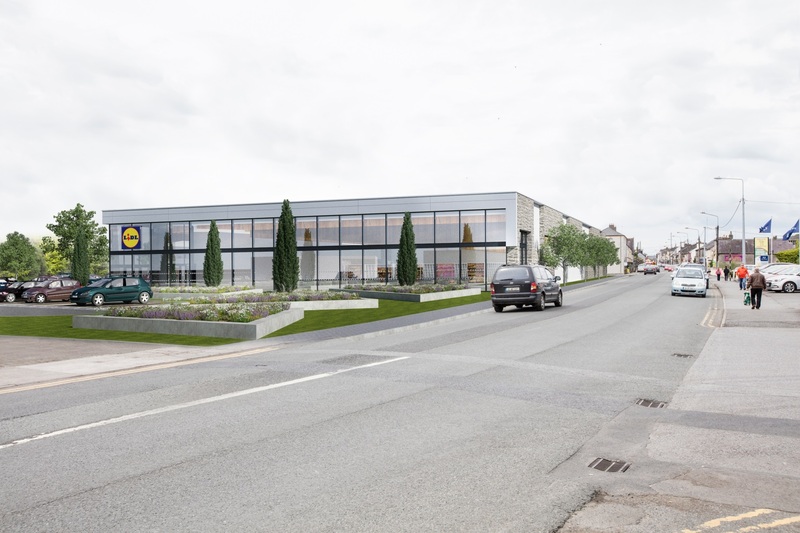 Lidl says it expects that the work will be finished on the new store on the Church Road by mid summer 2019. Up to 90 people will be on site during the construction phase and crews have begun the process of clearing the site with fencing also being erected. Final planning permission for the project was granted in September. Lidl withdrew an appeal of An Bord Pleanala after initialing objecting to some of the conditions imposed by Offaly County Council when granting planning permission. The area where the new supermarket will be situated is in need of considerable regeneration. It will provide 20 permanent jobs on completion and the completed building will incorporate local stone cladding as this artist's impression shows. On completion of the project, Tanyard Lane, from Arbutus Court to the Hophill Roundabout, will remain open. Tanyard Lane will be converted into a one - way system heading towards the town centre. There will also be a designated walking and cycling area with new road markings and signage. Lidl will also provide a new stretch of road infrastructure for the town linking Church Road with Tanyard Lane and additional local amenities including a new riverside walk along the Tullamore River and a crèche building which will be located along the Tanyard side of the property.